The New Orego-Stim Avian Complete is a 100% natural supplement and is used and recommended by top breeders of all types of birds. Avian complete is to be added daily to the drinking water and it works by cleansing and replenishing the gut lining to improve the overall health of the bird. 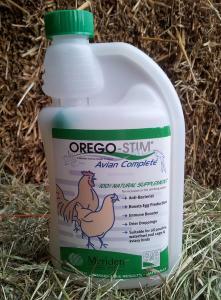 Orego-Stimm Avian complete is compatible with all other products such as grits, vitamins and minerals. fresh drinking water. Should not be used in undiluted form.